At RSG we've always believed that scenario-based analysis represents the most efficient approach to understanding your needs when looking to determine the right vendor shortlist. Vendors will claim broad applicability for their platforms, but we find in in reality they tend to excel at a subset of business use cases. 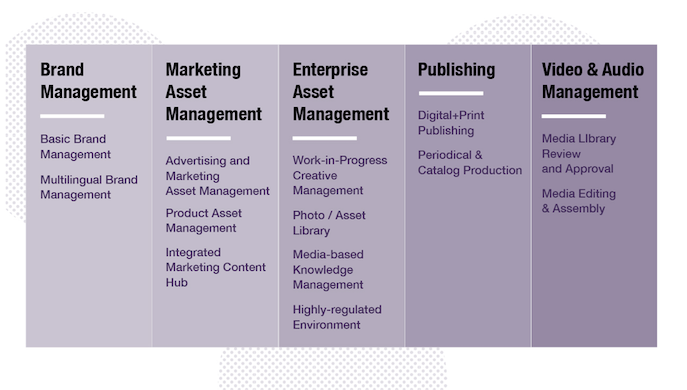 This is especially true in the digital asset management (DAM) world, with a fragmented marketplace featuring a wide variety of suppliers. So a savvy customer will prioritize their needs. In a recent series of blog posts, I laid out 13 canonical DAM scenarios, across five key categories. Here's a quick index. Click through for more details on the ones that seem most apt for your enterprise. What's particularly interesting to me in this context is an emerging divide between DAM vendors who can handle really complex business scenarios and those oriented towards simpler use cases. Of course, not everyone has complex use cases, and you should never over-buy this technology. But if your needs take you beyond more basic brand management, you need to take a particularly skeptical eye towards your potential DAM platform partners.